"Rather! For some of us it was by no means a new job!" said Pyotr Podkopailo to reporter of Krasnaya Zvezda during one of the meetings aboard Admiral Vinogradov. "Pacific mariners have accumulated experience of convoy escorting since early 90-ies when our ships sailed off for combat service in the Persian Gulf due to well-known events. By the way, I've been there for the first time when being a lieutenant and our ASW ship had been escorting civil vessels in Sept 1989-Feb 1990, Sept 1992-Jan 1993 and Nov 1993-March 1994. And note that I'm telling you of Admiral Vinogradov, but there were other ships of our division as well. Another story is the Gulf of Aden where I sailed as a ship commander. There we applied new counter-piracy approach more actively using capabilities of naval aviation. Having escorted 12 convoys, our helicopters took off dozens of times keeping the zone under control, providing reconnaissance of threatening directions and preventing ship assaults after all. For that purpose our excellent helimen Lt. Col. Alexander Voronin and Col. Igor Shlykov had a team of machinegunners aboard their Ka-27. Those guys preventively fired on pirates' junks. Consider, our "wings" flew out day and night! The second specific thing was close informational interoperability with foreign ships. With Indian frigate Tabar, in particular, we jointly escorted a convoy and prevented pirate attack on Swiss cargo vessel. Analyzing crew actions while on mission, the captain mentioned all units and services, but distinguished contribution of engineering department led by Capt 2 rank Artur Golovaschenko. Primarily thanks to efforts of machinemen, normal performance of all mechanisms and equipment was maintained through all 25 000-mile cruise period. Capt 2 rank Golovaschenko himself considers that all occasional contingencies appeared during the cruise were settled by virtue of collective endeavour with might and main. "Sometimes we tackled problems could have been solved only by factory experts", tells engineering department officer. "But there were no "industry" aboard so we had to rack our brains to eliminate breakdown as soon as possible. After that cruise shipyard experts were amazed how in that conditions we could replace stern gear packing [screw shaft gasket – author] within 20 hours of nonstop work without water getting inside?! They say it takes several days even in shipyard conditions... It was a snap! We called upon divers from Fotiy Krylov rescue ship (they worked outside stern), and the rest of repair was performed by propulsion division officer Capt. Lt. Alexander Polevschikov and skilled seamen: turbine operator Ildar Ishdavletov, bilge operators Dmitry Maksimenko, Denis Saveliev and other tough guys as it was extremely hot down there, in machine space! I myself rolled up sleeves too, spending hours there. In such manner we fixed the breakdown along with divers; the ship continued escorting convoys in a day. At times the situation itself made us look for a remedy, and the crew members took themselves in hand and became somewhat more responsible at the cruise. There was no need to prod sailors. If a trifling leakage appeared, all were involved without demand; if necessary, after warrant's advice. Concernment for common job was obvious. "...The crew showed fortitude and toughness, demonstrated high naval skills during the cruise in conditions of permanent psychological tension, threat of pirate attacks, considerable temperature difference, high humidity, tropical heat, and up to force-five sea disturbance. Most of officers and enlisted displayed high discipline and order, sleeplessly kept sea and special watches, inviolately obeyed combat and operational instructions". That was a passage from the order of Pacific Fleet Commander upon results of the distant cruise. 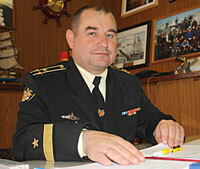 The same order encourages many crewmembers of Admiral Vinogradov. Among them are engineering department officer Capt 2 rank Artur Golovaschenko, ship deputy commander for educational work Capt 2 rank Sergei Yukov, second in command Capt Lt Artyom Kolpaschikov, propulsion division officer Capt Lt Alexander Polevschikov, aerial and surface picture group officer Lt Vasily Rykov, turbine operator squad leaders petty officers 1 class Evgeny Nefyodov and Denis Roschuk, petty officer 2 class Viktor Burlakov, mine-torpedo team leader warrant officer Dmitry Korsakov, senior electrician of AA artillery battery seaman Andrei Osenin. "All those who were in that cruise will dream about it for long time, that's for sure", says ship deputy commander for educational work Capt 2 rank Sergei Yukov. "We've sailed nine seas and two oceans. The crew's daily life was full not only with busy combat service but marine romance and memorable meetings in foreign ports, too. For us, it was very important to weld replaced and renewed crew from the very first days of the cruise; to make personnel be morally ready and psychologically capable to fulfill all forthcoming missions. I guess what played into the hands is that the ship had been 94% remanned with contractual serviceman. Moreover, there were no rookies among the crew – all sergeants and seamen had multiply taken the sea and participated in various exercises. Morale and psychological backup of the distant cruise was executed in a staged manner in accordance with operation instruction. Six officers from educational department were engaged in this work at sea. Particularly, much attention was given to prompt informing of personnel about cruise objectives; popularization of examples and experience of those who had distinguished themselves; training alertness, explaining responsibility for violation of Russian active legislation. To help people deal with informational hunger far away from native land, we regularly refreshed ship information stand, hung printed news in crew quarters, switched on news radio during meals, taught social-political lessons. Informational system included daily morning broadcast with reports of watch officer about ship events, juridical briefing during watch mounts and evening roll calls. Every day news radio Subchaser concluded passed day and informed about plans for the next one. By the way, officers and warrants asked to give detailed news of Primorsky Krai, in particular, of Vladivostok. Everybody was anxious about financial crisis which could affect their families somehow. During the cruise we successfully tested such method as congratulating sailors with their birthdays. That was done to create positive atmosphere among the crew. Normally, the ship commander presented a birthday card to a celebrant at morning parade; if it was officer or warrant, it might be videotape and gifts from his relatives. Those gifts had been taken beforehand at the base and were stored at deputy commander's office. During evening radio news there were congratulations and a song for that sailor. By that time ship bakers cooked delicious cake or pie and ship commander or his assistant handed over the sweet gift to festivity causer. Such event must be forever borne in mind of senior warrant officer Yuri Dedurenkov turned 55 on March 31. The ship was prowling waters of South China Sea at that time! In total, 147 birthdays were celebrated during the cruise. Other events were also used for the educative purpose. For example, when the ship was passing the place of memorable Tsusima battle of Russian-Japanese War, all uninvolved personnel by a perennial tradition paraded on the poop and saluted to distant age compatriots – imperial navy mariners. A documentary Dedushka Rurik, made by enthusiasts from Iskra PF Maritime Search and Development Centre led by former submariner Vladimir Kartashev, was shown same evening at the mess-room. In 2004 at Korea Strait Kartashev's team found and explored wreck of armored cruiser Rurik sunk in naval battle between Vladivostok cruiser group headed by Admiral Iessen and Japanese detachment under flag of Admiral Kamimura. The documentary was based on results of that expedition and historical archives. On February 9, under program of social-political training and considering commemorative date we had a lesson "Heroism of Varyag cruiser in Russian-Japanese War 1904-1905 as an exemplar of bravery, courage and solidarity of the crew". In winter, being in Arabian Sea, the crew celebrated 20th anniversary of the ship. It seemed symbolic to everybody that despite venerable age Admiral Vinogradov does not stagnate at moorage but executes combat tasks overseas. Apart from endless watches there was some time for leisure, too! Ship library had always been in good demand, and in evening time one could amuse himself at the heliport where videofilms were regularly displayed. By the way, preference was given to patriotic comedies. Commissioned staff watched DVD movies on PCs. During lunch-break and simply at loose hours sailors indulged in volleyball on the heliport, played dominoes, chess or checkers. At weekends and holidays number of sport tournaments held on topside deck – pull-up, weight-lifting, volleyball, dominoes, chess and checkers. If weather banned, such activities held in the mess-room. Sometimes competitions revealed genuine athletes. Example, SAM system senior operator Seaman Vitaly Snegirev made 31 pull-ups. And those who were fond of bodybuilding could build up muscles at sport site located between left and right waist decks. "Every crewmember will remember New Year party arranged at 23rd day of the cruise in Arabian Sea in the latitude of 11°08' and longitude of 59°39' ", tells Capt 2 rank Sergei Yukov. "At noon Dec 31 we set a 2-meter New Year's tree on the heliport and there were plenty of volunteers to decorate it. Then we arranged contests for best decorated room and best New Year poster; group of marines sailing with us was also involved. The highlight of performance was possibility given by our comm experts to contact with relatives in the New Year night. What a strong impression it was! After that it was a little New Year show with Santa Claus, Somali Pirate and other characters. Not less important for us were crossings the equator. We arranged theatricals with Neptune Sea Lord; what a wonderful time it was… Of course, such kinds of activities drew away from the service, remind relatives and kept us in fine fettle. By joint efforts of all commanders and educators we managed to create good psychosocial environment in collective and eventually to complete all tasks of the distant cruise. The crew considers it is not improbable that next year they will be confided to serve overseas again. Undoubtedly, inestimable experience was accumulated during the last cruise which would be helpful for other ships in the future. Nevertheless, sailors of Admiral Vinogradov by no means slow down the tempo of combat training, improving tactical skills day by day. One of the scheduled phases was participation in Primorsk Flotilla exercise on search-and-destroy "enemy" sub, where the ASW ship has successfully executed a number of combat drills. "For the first time in two decades we had retrieved our permanent presence in Indian Ocean and will stay there on behalf of Russia and international community. ASW Admiral Vinogradov has become the first Russian ship applied absolutely different convoy escorting technique which has proved its high effectiveness. Having adopted this method, ships of international community now act like Russian sailors did. Admiral Vinogradov – followed by Admiral Panteleev and Admiral Tributs – escorted dozens of convoys from various countries and prevented numerous pirate attacks. It may be one ounce of counter-piracy measures; nevertheless, it is Russia's contribution to a great common cause. Nowadays we prepare the fourth Pacific Fleet task unit to head for Indian Ocean and shift their fellows."